Civic Type R: Just the thing for Honda? 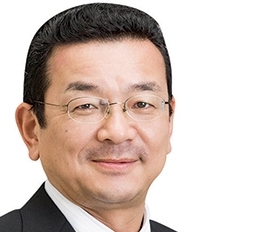 When Takahiro Hachigo returned to Japan in March after years overseas to be Honda's new CEO, he didn't rush out to buy a new car. Indeed, the car-crazy veteran chief engineer remains probably one of the few auto executives anywhere without his own set of wheels. But Hachigo is holding out for a reason. "There is a model I want, which will, as I have told you, be launched this autumn," Hachigo said. "I will wait ... I want to buy the Civic Type R."
The hot hatch will be manufactured at Honda's plant in England and exported worldwide, including to the U.S.
Hachigo: Is it fall yet? The revived Civic Type R is powered by a 2.0-liter turbocharged engine that generates 306 hp. Honda is quoting a 0 to 62 mph time of 5.7 seconds and a top speed of 167 mph. The car speaks both to Hachigo's personal predilections and strategy for Honda. Regarding the strategy, he aims to revive Honda's reputation as a purveyor of innovative engineering, stylish fun and cutting-edge cool. He said: "I joined Honda because I loved cars and driving."